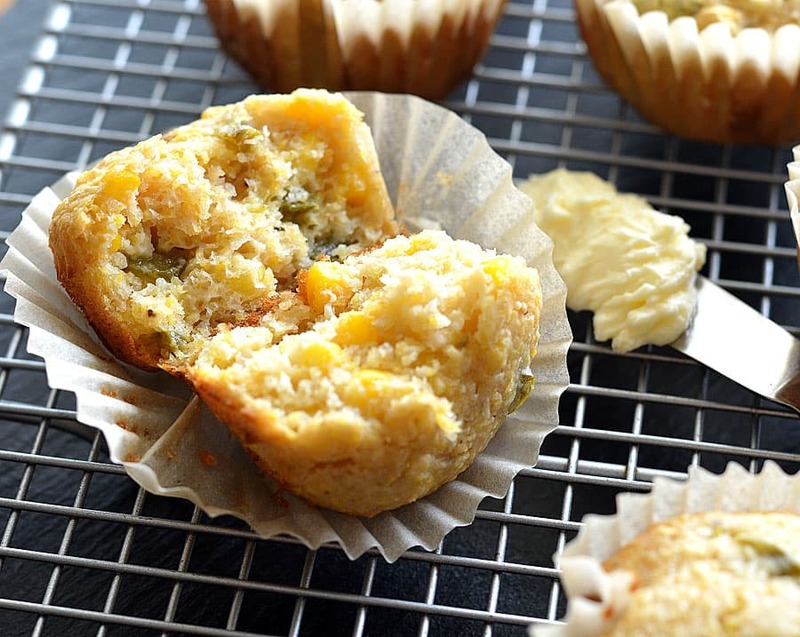 These delicious Jalapeno Corn Muffins are the perfect balance between sweet and savory. They are especially tender muffins due to the addition of vegan sour cream (you can use cashew cream or even coconut milk if you prefer) and get their sweetness from the applesauce I used instead of an egg in this recipe. You can make them as spicy as you can take it, but I kept it mild and it was plenty spicy for me. 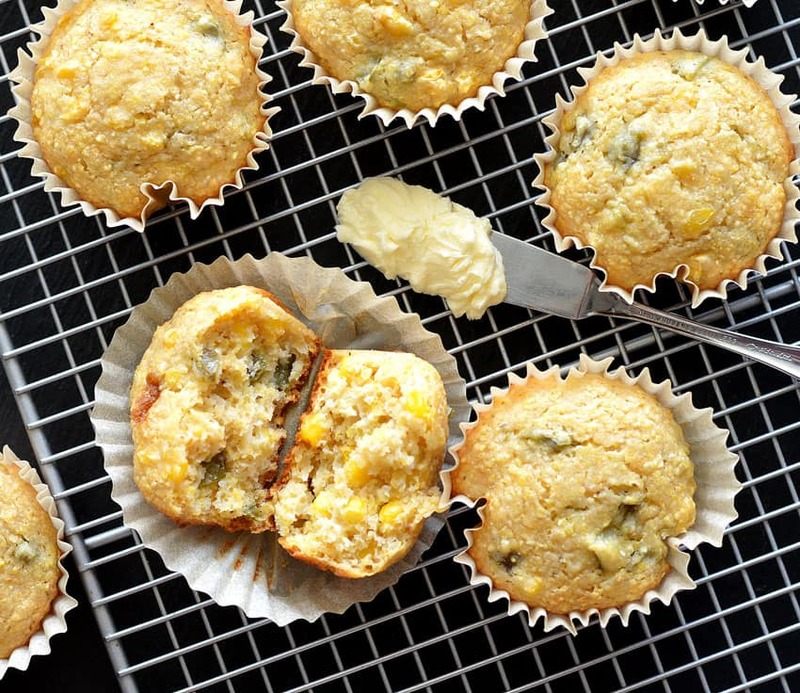 Serve them warm with a bit of non-dairy margarine and perhaps, a drizzle of agave? The perfect side to any fall soup, stew or better yet, chili! This recipe comes together really quickly. The dry ingredients (flour, cornmeal, brown sugar, baking powder, salt, baking soda and pepper) are whisked together in a small bowl. In a separate bowl, mix together applesauce, sour cream, almond milk and oil. The two mixtures get combined and lastly, the corn and jalapenos are folded in. Do not over mix. 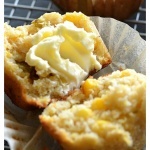 Line a muffin pan with wrappers and using a scoop, fill them 2/3 full. 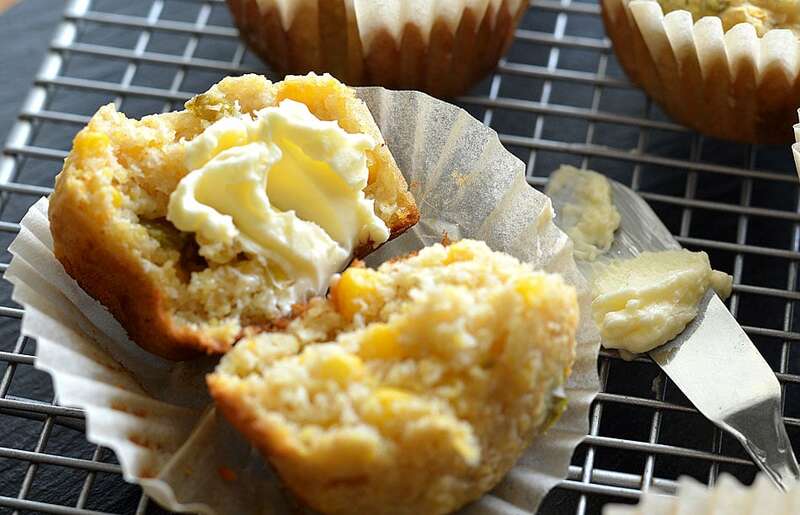 Do not overfill the baking cups. Bake at 400 degrees for about 14-16 minutes or until a toothpick inserted comes clean. Cool for a few minutes in the pan and then remove to a rack to cool completely. I like to serve them warm with a bit of vegan margarine and a drizzle of agave syrup. This cornbread would pair perfectly with this Lentil, Black Bean & Eggplant Chili. Or any chili for that matter. Wishing I had made some. The dry ingredients (flour, cornmeal, brown sugar, baking powder, salt, baking soda and pepper) are whisked together in a small bowl. Yummy! But I’m a sucker for every vegan cornbread recipe. I had leftover cashew cream and agave frosting, so I used that. No applesauce, so used flax seed meal and water. Farmers’ market jalapeno minced was the last substitution. Just curious – how can it be considered Vegan when you use sour cream? If you are using a plant based sour cream it would be nice if you specified that. I’ve used coconut milk in my cornbread recipes and it has come out well. Hi Marla, The vegan alternatives were written in the first paragraph of the blog post…so yes, it’s vegan 🙂 But, I have updated the printable recipe as well for those who are skipping straight to that. As it is a vegan blog, it gets very repetitive stating “vegan” everything. All of the recipes, including the ingredients, are all vegan unless stated otherwise. I hope this helps!